Follow the latest updates on Mandatory Fees here. Resolution to be presented at the Oct 31 ASM Student Council meeting and the Nov 5 Faculty Senate meeting. In March and April 2018, graduate workers protested UW-Madison’s decision to change the mandatory fees payment schedule without the input of graduates. This decision would have required graduates to pay their fees before receiving their first paycheck each semester. After weeks of organizing, a petition drive, and two mass actions in Bascom Hall, graduate workers prevented the administration from changing the payment schedule. In short: graduate workers won through the direct expression of their power. 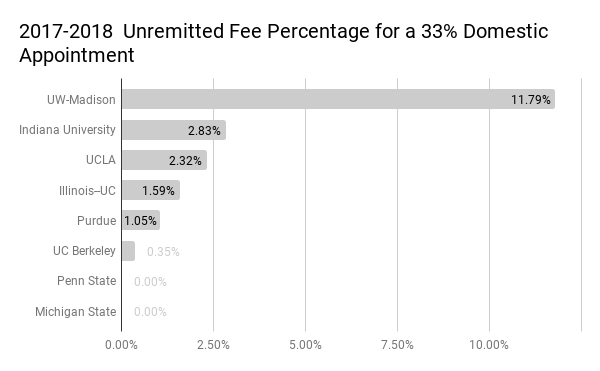 However, during the campaign, the TAA collected hundreds of stories describing the financial burden of these fees for graduates, despite the flexible payment schedule. Most graduates pay $600 per semester and international graduates pay an extra $100. Meanwhile, other universities such as University of California-Berkeley and Michigan State University offer the same services our fees pay for without charging graduate workers. It became apparent to the TAA during the campaign that a more equitable university is possible. Graduate workers should not have to pay their employer for the right to work at this university or for vital services such as public transport and childcare. As a result, the TAA decided that the campaign would enter into a second phase to demand the university remit mandatory fees for all graduates who labor for this university. Read the TAA Platform on Graduate Pay and Fees and the TAA Issues Statement on Graduate Pay and Fees here. Since the beginning of fall semester, TAA members have worked closely with members of the Faculty Senate, the University Committee, the Associated Students of Madison, and our sister union, the United Faculty and Academic Staff, to pressure the administration to remit graduate workers’ mandatory fees (which constitute 0.2% of UW-Madison’s budget). Resolutions will be presented at the October 31 ASM Student Council meeting and at the November 5 Faculty Senate meeting by the TAA’s allies. Union representatives will attend these meetings to encourage the shared governance bodies to resolve that the administration should remit mandatory fees. All graduates interested in supporting these measures should attend these public meetings. In the meantime, TAA activists have launched a survey asking graduates what they would do with the extra money each semester if these fees were remitted. The union intends to share these stories with the administration. While shared governance procedures are an important tool in making this university more equitable and democratic, it is primarily through graduates’ direct expression of their power—through their stories and direct action—that we can improve our material conditions. Anyone interested in getting involved in this campaign should reach out to the Stewards’ Council at stewco.chair@taa-madison.org. Bring your grading, bring your thesis, bring your students. Take action to improve our working conditions! A Work-In is a way to demonstrate the often invisible or unrecognized labor graduate workers do to support the university. On April 26th, we will bring our work to them—we’ll occupy the administration’s space while doing our work together. Write lesson plans, write your dissertation, grade papers, do data entry, hold office hours, even hold class! The University of Wisconsin–Madison works because we do. The University must implement policies that help graduate workers. Mandatory segregated and international student fees impose financial hardship on graduate assistants. By making our work visible, we are calling on our administration to remit these fees while continuing to fund student services. It is further RESOLVED, that the university will not deflect the costs of remission of mandatory fees to departments or employing units. We are working with the Associated Students of Madison and Faculty Senate to pass similar resolutions. The University must act now to better support its graduate workers. Last summer the UW-Madison Bursar’s Office unilaterally decided to revise its current practice of allowing graduate workers to pay mandatory fees until after receipt of their third paycheck each semester. The revised policy will require graduate workers to pay all segregated fees each semester before receiving their first paycheck. This policy change places an undue economic burden on graduate workers, considering these fees are at least 10.4% of the typical non-dissertator graduate workers’ income, many of whom are unemployed over the summer months. The Teaching Assistants’ Association graduate labor union opposes any change to our current fee payment policy that increases the economic burden of graduate workers. To that end, we are asking graduate workers and allies to sign a petition and attend a demonstration supporting our opposition to the Bursar’s proposed policy changes. To support our efforts, we asked graduate students and allies to sign a petition opposing any policy changes that increase the economic burden of segregated fees on graduate students. We, the undersigned graduate workers (and allies) at UW-Madison, oppose any policy changes which would result in graduate workers paying segregated fees prior to our first paycheck each semester. We demand that, in the future, the Bursar’s office consult with graduate student representatives before making sweeping changes to graduate student payment policy. We further demand that, because segregated fees present an undue financial burden on graduate student workers, that the Graduate School cover all or partial segregated fee charges. On Thursday, March 22, TAA members organized a demonstration where we delivered the petition signatures of more than 1,000 graduate employees—one-third of the graduate assistants on campus—which had been collected in the preceding two weeks to campus administrators. A dozen grads shared personal stories of hardship imposed by mandatory fees with the Dean of the Grad School, the Vice Chancellor for Finance and Administration, and the Bursar. We are building on this March action as we continue to organize toward a better mandatory fee policy. Through a 2013 agreement between the UW-Madison administration and the Teaching Assistants Association graduate student union, graduate students currently have until after receipt of their third paycheck each semester to pay their respective mandatory segregated fees ($630/semester) and international student fees ($100/semester). In May 2017, the Bursar Office announced it would require graduate workers to pay all tuition and fees in full prior to the start of each semester, a full month before graduates’ first paycheck of the academic year. To add insult to injury, those graduates who cannot pay in full would have the option to enroll in a three installment payment plan for an additional $50 fee. The TAA asserts this administrative change puts fee payment and administrative compliance before the economic well-being of graduate workers. This would be an undue burden on graduate workers, many of whom may have to decide between paying their fees or covering basic needs such as rent or groceries. The Bursar established this plan in order to comply with UW System Administrative Policy 805. TAA Co-Presidents have been meeting with the Bursar and administrative officials to discuss solutions that have not been explored, including segregated fee remission, scholarships to cover segregated fees, or even allocating more resources to the Bursar so that the current policy isn’t a burden on her office. Throughout this process, the TAA has shown its commitment to finding a mutually agreeable solution, albeit one that appropriately prioritizes the economic well-being of graduate workers and is crafted with their input. We would like the Bursar’s Office and university administrators to follow suit. The university works because we do. Graduate students are an integral part of the university and occupy a unique position in its workforce. We are critical to the university’s ability to fulfill its educational and research mission, helping to improve the lives of residents of Wisconsin and beyond. Our ability to fight this unilateral change and push for a better policy for graduate workers depends on our collective effort.